Coffee-Mate Non Dairy Creamer (Liquid) in bulk 180 count cases. Great Product. Great Value Does not require refrigeration. 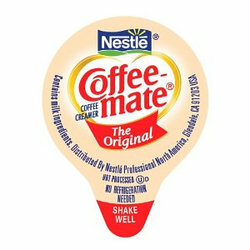 Coffee-Mate Non Dairy Creamers are the market leader. Available in 3 flavors, Original, French Vanilla and Hazelnut. Available for delivery in Atlanta, GA or shipping nationwide.